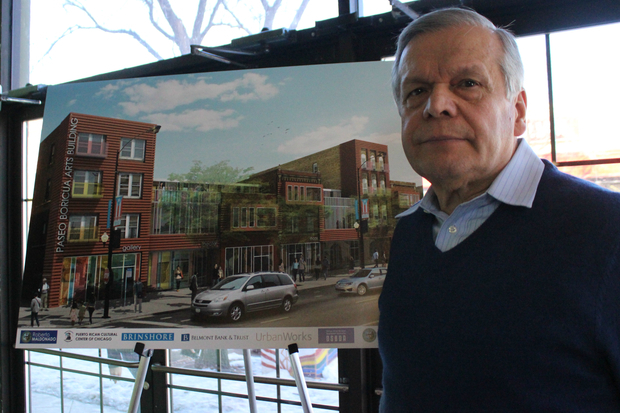 HUMBOLDT PARK — Planners envision new Paseo Boricua Arts building to create a cultural hub when it opens next year. Jose Lopez, executive director of the Puerto Rican Cultural Center, was joined Monday by Ald. Roberto Maldonado (26th), State Sen. Cynthia Soto (D-Chicago) and nearly 100 people to unveil the center for artists set to open in 2016. "Today, we are here as probably one of the most important occasions in the history of this community," Lopez said. Noting that artists could live at Paseo Boricua, Lopz said: "We are looking to bring housing that is different, that speaks to the idea of creating hubs for like minded people, who share values and share visions. That is what this art building is about. "For us, this is indeed, a dream come true," Lopez added. The new arts center will include 15 live/work apartment for artists and their families, retail space, a multi-media theater, a 3,000-square-foot gallery, and a piano lounge. The project, which is the fruit of a collaboration with Brinshore, Belmont Bank and Trust, and Urban Works, has acquired seven buildings on the 2700 block of West Division Street, including the site of the former Ashland Sausage Company. Lopez lauded Maldonado and Soto for their commitment to Humboldt Park and getting the new arts facility off the ground. Maldonado said the new building would be essential to re-imagining the community. "We don't want to lose the next generation of artist to other cities like New York. We want them to stay in Chicago. The Paseo Boricua Arts building will be a cultural hub for the community and a place that inspires creativity," Maldonado said. Planning for the new Paseo Boricua Arts building started more than ten years ago, said Eduardo Arocho, executive director of Division Street Business Development Association. "We surveyed local artists in 2004 and continued interviewing over the next decade," Arocho said. The goal "was to create a space that would complement the local community, businesses, as well as the festivals and parades we have here on Division," Arocho added. "We wanted to create take away this blight." The next phase of the project is to raise $11 to $14 million through private, public and non-profit funding sources, Arocho said. Brooklyn Priestley, 24, an artist in Humboldt Park who stopped by for the unveiling, said he was excited to see the plans for the new center and commitment to the arts. "It's great for the community, and it's great for artists," Priestley said. "I could see myself living in one of the apartments."